SERVPRO of Texarkana uses truck-mounted extraction on water damages and carpet cleanings. This allows us to remove a significant amount of moisture helping us dry faster and allowing you to walk on your clean carpet sooner. The moisture you can't see is just as harmful to your home as the moisture you can see. That is why we use everything at our disposal to find and eliminate all the moisture from your home. Spring storms bring strong winds and roof damage to a local home. The homeowners called SERVPRO of Texarkana and we were able to tarp the roof to prevent further damage until it can be repaired. While it is not surprising for a crawlspace to have some small spots of mold growth in it, once it is discovered you need to address the source of the mold. There can be many contributing factors that aid in creating an environment for mold to grow. If you do not remedy the cause time will only allow that problem to grow, sometimes exponentially. This home's HVAC unit was the cause of the moisture in this crawlspace. SERVPRO of Texarkana was called out to inspect and assess situation. We know that water doesn't wait until business hours to cause damage, and we don't wait until business hours to clean it up. We offer 24 hour emergency services so you can reopen as soon as possible. No it's not baseball but it is training; a Fire and Smoke Restoration class attended by several members of the SERVPRO of Texarkana team. Continued education plays a large role in our ability to consistently deliver the best service in Texarkana and the surrounding communities. SERVPRO of Texarkana is a great source for all of your upholstery cleaning needs. We are able to assist you with cleaning upholstery of all types including draperies, seat cushions, area rugs and oriental rugs. We can clean them onsite in your home or in our local service center in Texarkana, TX. We are your Fire, Water, Mold, and Cleaning Experts - available 24 hours a day 7 days a week for your emergency. The drying equipment is up and running after a large water loss at this commercial property. No size water loss is too large for our SERVPRO of Texarkana team to handle. Should your home have water damage or flooding resulting from a water heater or other household appliance, contact our IICRC certified and experienced team for remediation at 903-832-4400 right away. We take drying seriously here at SERVPRO of Texarkana. That's why we may drill holes in baseboards and point our air movers at them. We want to make sure air gets inside the structure to dry it completely so there's no chance of secondary damage. This Photo depicts Why SERVPRO of Texarkana is the mold remediation company of choice for the Four States Area. When food, household goods, and items are exposed to mold, special care is needed to prevent contamination. Our team can construct containment barriers from thick, 6-mil poly sheeting to isolate and protect the inventory during the mold removal and disinfecting service. Business owners greatly appreciate our efforts to minimize their losses and place their trust in us. You can, too! We have been spotted at the Columbia County Library, but we're not there to check out the latest best seller! A burst pipe on the hot water heater caused extensive water damage and our team is on site to make sure they are able to re-open and resume normal business very soon. 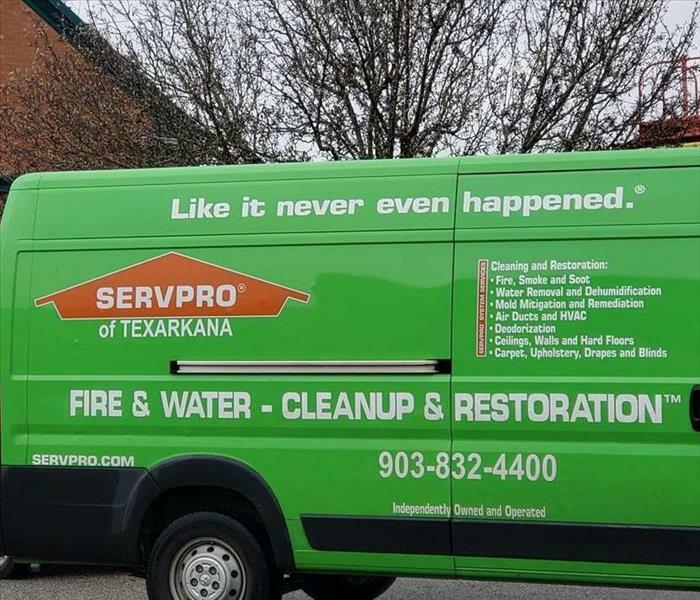 If you have water damage to your residence or business, call SERVPRO of Texarkana 903-832-4400 and we'll make it "Like it never even happened." The Texarkana Area Veterans Council hosted its 20th annual Veterans Benefit Chili Cook-Off fundraiser on February 15th, 2019 at Texarkana College. Proceeds went toward assisting local veterans and buying a transport van to take veterans to local and area medical care clinics and hospitals. 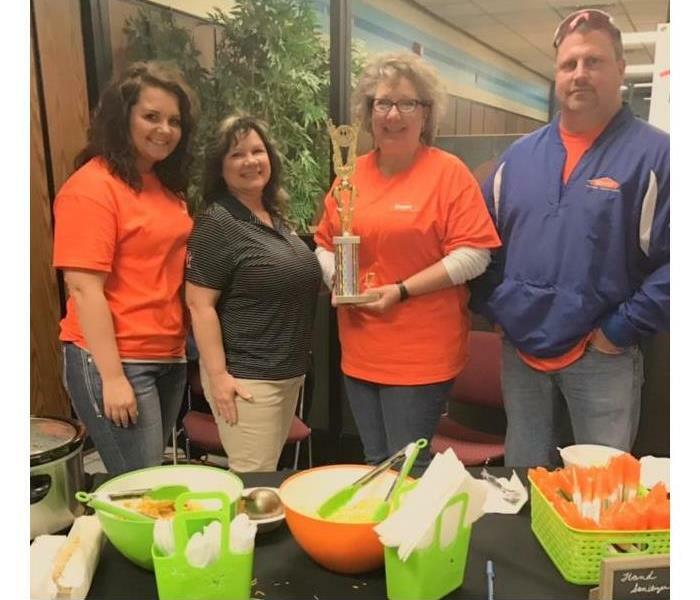 All area chili cooks participating in the cook off competed for first, second and third-place trophies in three categories: business, civic group and individual. Your local SERVPRO of Texarkana won first place in the business division. When this Atlanta TX business needed Commercial Restoration and Cleaning Services, they called SERVPRO of Texarkana. Our team of highly trained technicians responded quickly and are on site to restore this property back to normal conditions. The Restorative Drying for Water Damage continuing education class that was presented to local members of the insurance industry went very well. We always enjoy helping our agents and adjusters obtain their C.E. credits and want to thank everyone who attended this class. Spotted Our SERVPRO Vehicles Around Town? 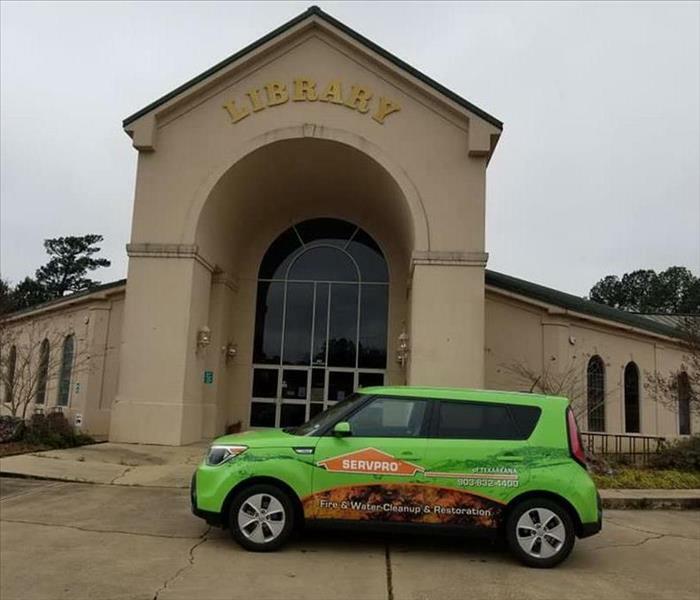 Have you seen our green SERVPRO vehicles around town yet? Our team is always out and about responding to various types and sizes of losses. SERVPRO of Texarkana is available 24 hours a day 7 days a week, even on holidays. If disaster strikes, don't hesitate to give us a call 903-832-4400. If you've ever asked "Why should I choose SERVPRO", this picture can help answer that question. On site of a property that had been damaged in a storm, we captured this photo. The top shows the debris pile after SERVPRO of Texarkana had completed demo. The bottom was taken across the street where the homeowner had another company working. There's the SERVPRO way and then there's the "other guys". A difference you can see. If you find yourself in need of emergency residential or commercial restoration and cleaning services, call SERVPRO of Texarkana at 903-832-4400. We're ready for any size disaster. At SERVPRO of Texarkana, our team is trained to safely remove biohazards and dispose of them properly in accordance with OSHA and health regulations. This can include, sewage backups, hoarding situations, chemical spills and even crime scene cleanup. In this picture of a local Preschool where a water leak caused extensive damage, you can see the drywall has been cut out. The cut is made 12-18 inches above where the flood damage stopped, that's why it's called a Flood Cut. This is done so the drywall can be removed and any moisture issues behind the wall can be addressed. Mold can be a serious issue in your home, and you may not even know it's there. It may be hiding in areas like the one shown in this photo. If you suspect you have a mold problem, call SERVPRO of Texarkana 903-832-4400. We have trained and experienced professionals who can properly assess and resolve the problem. Water damage doesn't always happen during business hours and, as this photo shows, can cause damage quickly. SERVPRO of Texarkana provides emergency services 24 hours a day so you can reopen as soon as possible. Once a fire starts, there isn't time to plan, but you can be prepared. Take time now to sit down with your family and make a step-by-step plan of action. When everyone is safe and the fire is under control, do what this homeowner did and call SERVPRO of Texarkana we can make it "Like it never even happened." Basements are not common in the Texarkana area but this beautiful historic home has one and it suffered a major flood. The water was approximately 6' deep when SERVPRO of Texarkana arrived. After the water was pumped out, a list of all the items damaged was made and the structure was dried. Call SERVPRO of Texarkana 903-832-4400! SERVPRO of Texarkana headed to Gilmer, TX to help a homeowner with water damage. 24/7/365 we are here to help! SERVPRO of Texarkana 903-832-4400. SERVPRO of Texarkana proudly serves the Four States Area! See any signs of Mold call us at 93-832-4400! 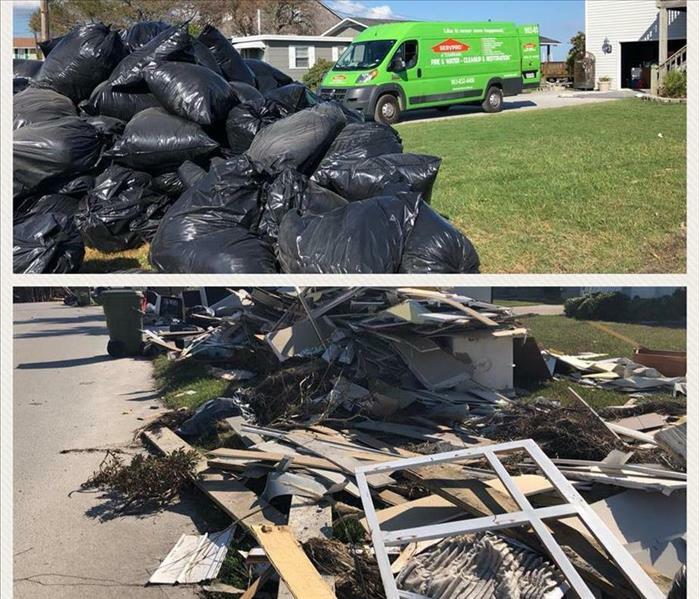 SERVPRO of Texarkana traveled to Detroit to help aid in the clean up following a major flood event. We have supported many SERVPRO Franchises in many other states as well during weather related events. This picture shows mold growth on the cabinets in a mobile home in Fouke, AR. This mobile home was vacant for several months and when owners checked in this is what they found. SERVPRO of Texarkana removed the cabinets and treated the structure with an anti microbial solution. This family was startled in the middle of the night by their smoke detectors. The fireplace was on fire. Damage throughout the entire home and on the outside was cleaned and restored by SERVPRO of Texarkana. Kitchen fires are one of the most common fires SERVPRO of Texarkana cleans and restores. This was a grease fire that caused damage to the entire home. All of the structure and contents were cleaned. This picture shows the damage from a water loss in Hope, AR. The loss caused significant damage to the entire building. SERVPRO of Texarkana began its drying procedures immediately and the building was dry in three days! When weather events happen around the country, SERVPRO of Texarkana is prepared to load up and move out. This event was in Virginia after a hard freeze. In this home all the drywall was removed and the structure dried. In this home an upstairs shower pipe burst during a freeze causing damage to the downstairs ceiling. This picture shows a containment constructed by SERVPRO of Texarkana. SERVPRO of Texarkana is an IICRC certified firm. This picture shows a local church water loss on New Year's Day. This happened during a hard freeze in the area. The church is one of the largest in our area and also has a private school. The church received a call from a police officer who was making rounds in the area and noticed water pouring out of the building. The church called SERVPRO of Texarkana and we were on site immediately. 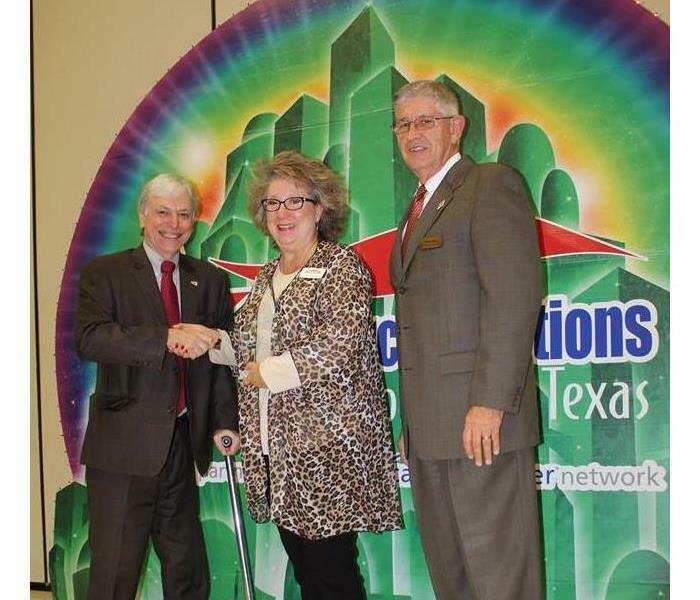 SMR Carri Campbell accepted the 2017 Veteran Friendly Employer of the Year award for SERVPRO of Texarkana from Northeast Texas Workforce Solutions. We are proud of our Veterans and proud of this award! This was what one of our technicians found while working Hurricane Sandy. SERVPRO of Texarkana is part of the Storm Team and travel to help out where needed! Our customers love to see our "sea of green" show up! A local jewelry store found discoloration in their ceiling tile and called us immediately. 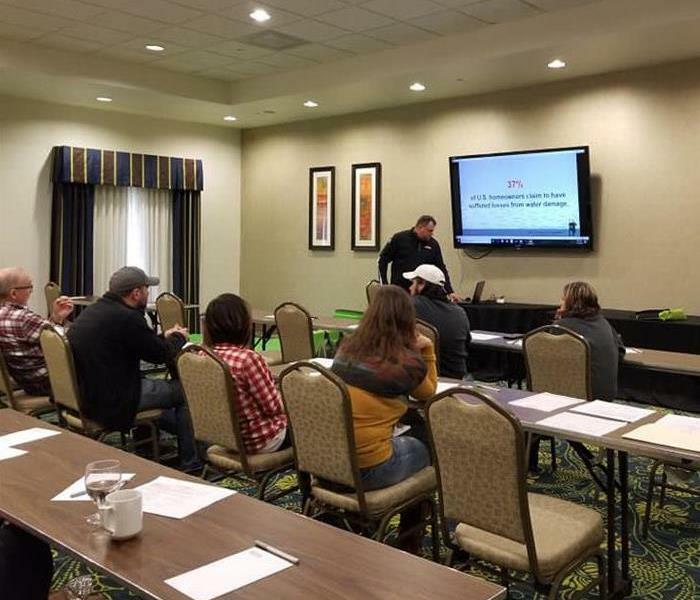 SERVPRO of Texarkana mitigated the mold damage and with our training in how to stop the growth from spreading the business was able to stay open. Board Up in Texarkana, TX. This fire was the result of a neighbor burning trash in their yard. SERVPRO of Texarkana was onsite and quickly boarded up the home to keep to keep it safe. The homeowner was happy to see our green vans pull into her drive! This home had its dryer vented under the house and had no ventilation. This caused the crawl space to have a lot of moisture. Once the weather warmed up outside the owner noticed a smell and a growth on her furnishings and wood. One call to SERVPRO of Texarkana and we got to work. In the end the homeowner was very satisfied with her home again. When a tenant noticed the discoloration of his ceiling he reported it to his manager. The manager called the mold licensed professionals at SERVPRO of Texarkana. We were on site immediately and had the job done quickly! 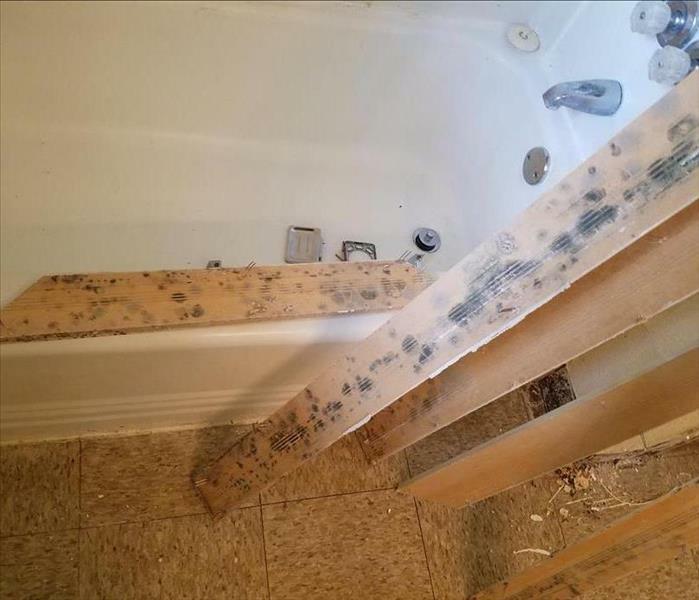 This mold was the result of a water leak that went undetected for many months! The owner of the apartment was very satisfied with the knowledge SERVPRO of Texarkana has in all types of microbial growth. Our textile department recently cleaned items smoke damaged in an RV that had an electrical fire. SERVPRO of Texarkana is a turn key operation. Our textile department is trained on all the current equipment and chemicals for cleaning all damaged items. This customer was happy he elected to put his water softener system in his garage! He awoke to water standing in his garage. The top had become disconnected overnight causing damage to the ceiling in the garage and the kitchen cabinets on the other side of the garage. SERVPRO was on site immediately to mitigate the damage. The business next door to this boutique had a plumbing malfunction which led to water coming under the walls. SERVPRO of Texarkana dried everything in place. The boutique was closed for a minimum amount of time. A local contractor had a mishap while changing out cable boxes. Damage was to two apartments. SERVPRO of Texarkana was on site immediately to begin work. The downstairs apartment sustained the most damage. The upstairs apartment faired much better. A tree fell on this house in the middle of the night. There was not a storm, no rain, no wind, it just fell. It was huge and caused major damage to the entire home. SERVPRO of Texarkana was called out and we had the tree removed, home boarded up and then we got to work. The home was basically rebuilt and turned out great! A small Southwest Arkansas town city hall experienced a fire right before Christmas. A space heater was the culprit. SERVPRO cleaned all the contents, walls and floors. We also removed the ceiling grid. Luckily, the employees of the City were able to move to the newly built fire department right behind them and continue their day to day business until SERVPRO finished. A couple planning a romantic Valentine's evening at a local hotel decided to light a candle. This did not go well! The candle somehow caught the table on fire and the damage was significant to not only that room but adjacent rooms and hallway. SERVPRO responded within an hour to the call from the hotel maintenance manager. When a local hotel guest fell asleep with the Jacuzzi tub water running it over flowed and caused damage to the room and adjacent hallway. The maintenance manager called SERVPRO of Texarkana. Our crews were able to dry the room and the adjacent hallway with minimal distress for the other guests. This used to be a neighborhood, until a mile-wide CAT5 tornado tore through it, demolishing everything in its path. It broke our hearts seeing people sifting through the rubble trying to find something, anything that they could salvage. Most of our customers had never experienced anything like this in their lives and were shell shocked. More than one customer thanked us for guiding them through the recovery process, advising them on what information they needed to gather for their insurance adjusters and giving them a sense that this time would pass and their lives would become "normal" again. A volunteer fire department suffered smoke damage when a small fire broke out in their facility. 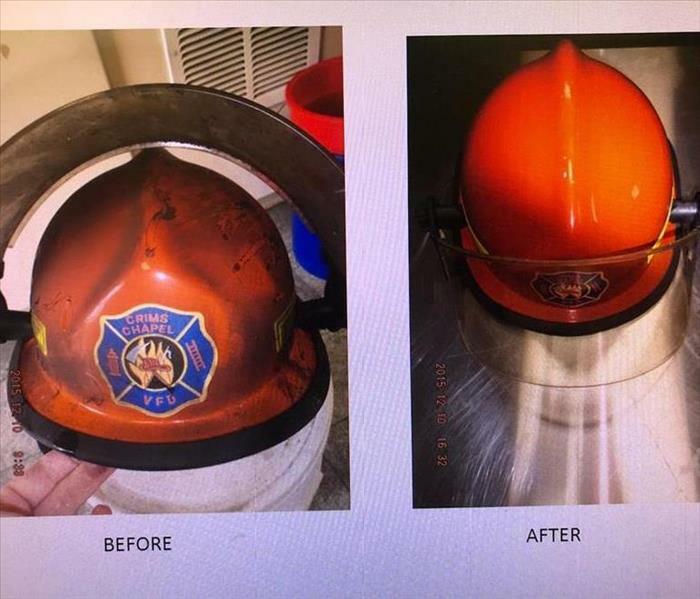 SERVPRO of Texarkana was able to come to their rescue and salvage their fire fighting gear. This is an example of what our professional products and state of the art equipment can accomplish. Thank you to our First Responders (fire fighters, EMTs and police officers) for all that you do! This was a fire at the police department. In addition to the structure being affected, all of the uniforms and tactical gear was damaged. 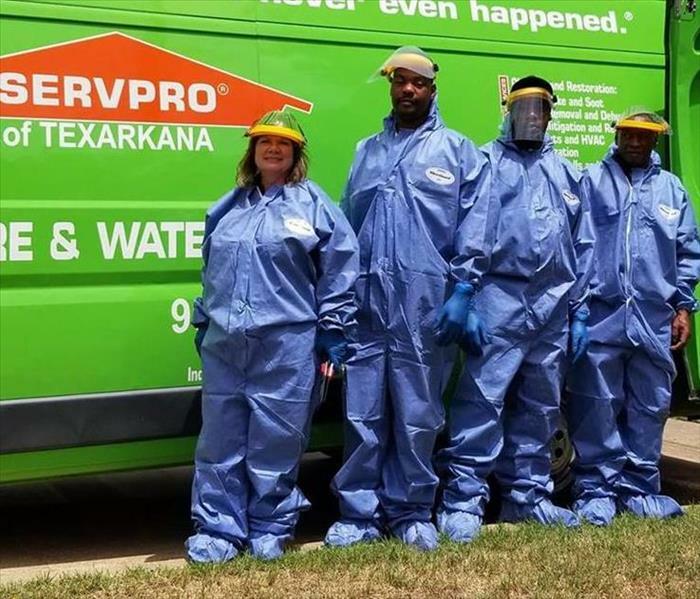 They entrusted their expensive gear and uniforms to SERVPRO of Texarkana. Using our professional processes and state of the art equipment we returned their tactical gear and uniforms to them soot-free and smelling great in the minimum amount of time. This is a boutique which suffered smoke and smoke odor damage when vandals attempted to start a fire on the second floor of the store. The store does not look like it suffered much damage; however, even a light smoke or soot will render new clothing unsalvageable. You can't clean it and then sell it as new. These owners' were devastated by this loss and it required them to shut down their business for weeks to inventory and remove the damaged clothing and products, clean the entire premises and get new stock in. Calling in the professionals at SERVPRO helped them to get back in business. 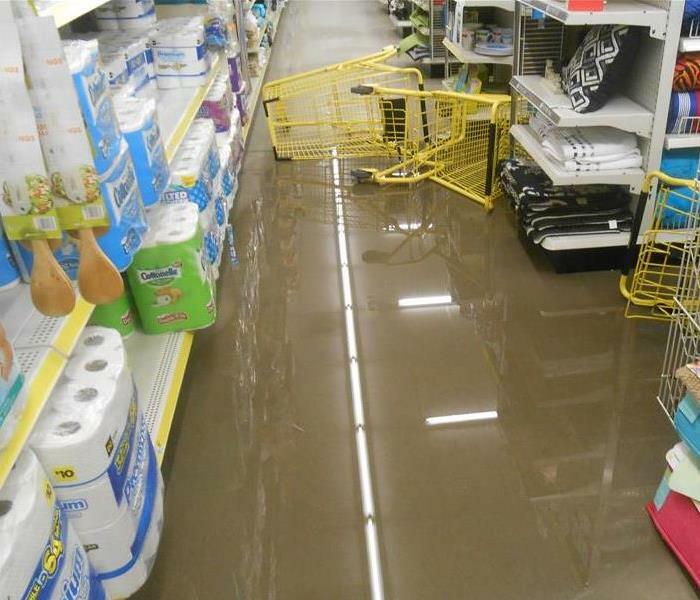 This is a Dollar General Store which suffered from flooding from a sudden, heavy rain storm which caused water to enter into the store from the rear entrance. The Dollar General had to stay in business in order to meet its quota, so they called SERVPRO of Texarkana, to prevent further water damage by extracting the flood water and drying their building; while allowing their customers to continue shopping throughout the process - always putting the safety of their employees and customers first and with as little inconvenience to the customers as possible. And SERVPRO made that happen. Our crew in Houston after Hurricane Harvey. You can see some of the damages here. When you are dealing with storm, flood, and water damage, immediate action is crucial. You should choose the company with storm damage experience and expertise that has the resources and equipment to handle the job. SERVPRO of Texarkana can respond immediately to storm and flooding conditions. We had a blast at the 2017 tournament at the Texarkana Golf Ranch! We enjoyed every minute. Our guys played hard and we loved seeing all the players as they passed by and we were able to give out some refreshments and snacks! Can't wait till next year! Ashley doing a great job cleaning an area rug from a water damaged home. Our professional cleaning can address moderate and heavy soil conditions in your carpets. How often you’ll need professional cleaning depends on soil build-up, traffic, type and color of carpeting. A good rule of thumb would be to professionally clean your carpet every 12 months. The best advice is to clean carpets before they become totally saturated with soil. We won 3rd place at the Veterans Chili Cook off!! We had such a great time at TC. Seeing everyone enjoy our chili was awesome.Thank you to all our Veterans. 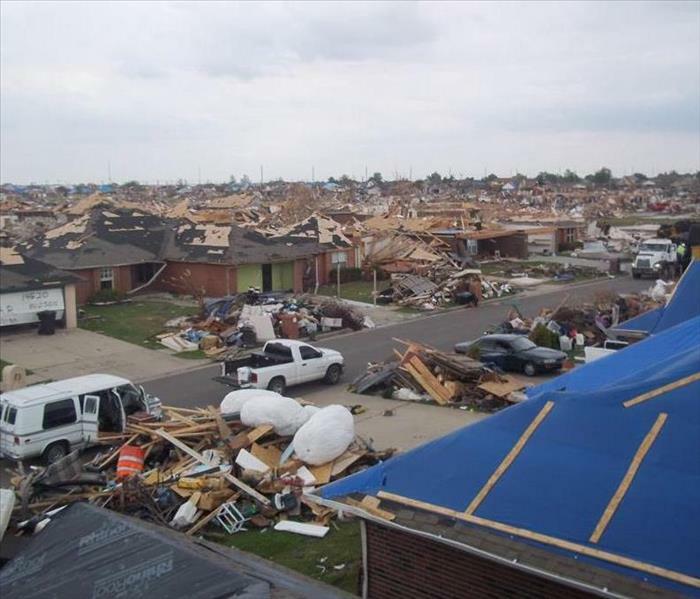 Devastion from the 2013 tornadoes in Moore, OK. When we entered the neighborhood everything appeared "normal" but then you turned the corner and all you could see was utter devastation. You could see people crawling over the debris, sifting through the rubble trying to find anything that they could salvage from the wreckage. One of our highly qualified SERVPRO team members! 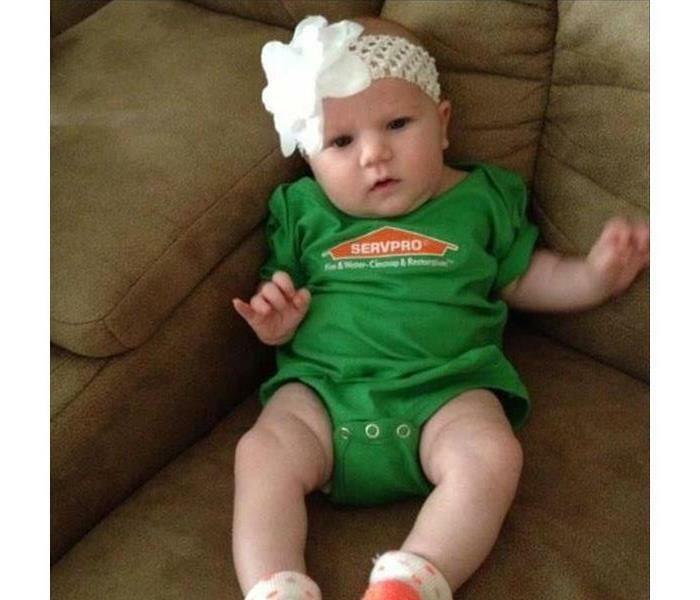 Our cute little SERVPRO baby, Leah, is the daughter of Amber Linville, one of our former SERVPRO employees, who, while working with us, finished her Masters Degree in education and has left us and has accepted a position in her chosen field as a teacher. Congratulations Amber, you will always be part of our SERVPRO family and we are so proud of you.